For many years, medical teams working on telemedicine have made a strong effort to define the telemedicine Body of Knowledge (BoK), and generate compatible standards that allow delivering telemedicine with adequate medical quality. The authors expect, after the European Commission statement on the Prague 2009 declaration, a new era for telemedicine. The essential barriers, which have already been encountered, include Literacy, Standard connectivity and Quality control. 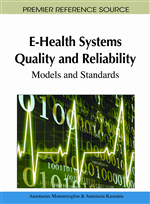 In the present chapter, the authors will address the item of Literacy regarding the type of standards in each of the topics of the Telemedicine Body of Knowledge. In 1998, we wrote, “the welfare expenses cannot be endlessly increased, whilst an efficient health provision system in the context of the information society, will mark a new trend to configure health care practice in the next century” (Ferrer-Roca & Sosa-Iudicissa, 1998). In this century and in spite of ICT improvements, the provision of health at distance is not taken as a regular medicine delivery but a “special” service, many times included in the new technology units (UINT= Unit of informatics and new technology) of the hospitals. If training and teaching schemes have to cope with society demands of health quality (HQ), health equity (HE), efficient health delivery (HED), and health security (HS) medical training should devote a substantial part to e-health and telemedicine. The main components of the Telemedicine-BoK as we defined in 1998 are listed in Table 1.